A friend gave me a couple of your books in the summer, and since then I’ve read all the novels, and as many of the short stories that I’ve been able to track down. I loved sci fi when I was little, getting everything by John Wyndham out of the library, graduating to the likes of Asimov et al (I love his story “The Bicentennial Man,” and think of it whenever I read something by you about Descartes and dualism) but I only relatively recently discovered women like Octavia Butler, so was delighted to discover another contemporary female author. I would have loved more Ammonite, but have accepted that’s not going to happen! However, I am more hopeful that Aud will one day return (I now take corners wide, and on a recent visit to Oslo, my daughter went to the sculpture park purely because I’d mentioned it to her in passing having read about it in your novel). ‘Historical’ fiction isn’t really my bag, but I think I’m going to have to make Hild the exception to my rule, as I love how you write nature into all your other novels, and I guess there’s a lot of scope for wild (in all senses of the word) writing in Hild. I also enjoy your blog posts and essays on writing; I’ve your manifesto printed up on my study wall. The ethos of that reminded me of Kakfka, when he talks about books being “ice axes” to break the frozen sea inside of us. Well, this was really all just a long winded way of saying thank you for your books, and for taking the time to write your blog, because it makes me think. Sorry, last thing: I heart your occasional photos of Seattle, because I have an old school friend who lives in Enumclaw, Washington State, and your pics help make me feel closer to her. G, your email arrived in my mailbox yesterday. Normally I’d just write back privately but Kontactr, the form I’ve been using, screwed up not only the formatting but your address: I have no other way to talk to you but here, in public. As I wasn’t sure whether you’d be okay with this, I redacted your full name. Now, on to your email. I have three collections of Ali Smith’s stories: Free Love and Other Stories (1995), Other Stories and Other Stories (1999), and The Whole Story and Other Stories (2003). I think she’s a truly original writer. Her work astonishes me. But I haven’t read “Writ.” I imagine the story is brilliant and terrifying. I’ll be adding Free Love and Other Stories to my collection soon. How exciting! So thanks for that, too. As for Hild, oh yes, the book is stuffed to the gills (to the mane, to the beak, to the fang; to the bough, to the beach, to the horizon) with nature. Hild is in nature all the time. Flora and fauna fascinate her: for its own sake and for the purposes of prediction (weather, war, wyrd). I believe you’ll like it. Think of it as a hybrid of Aud and Ammonite. 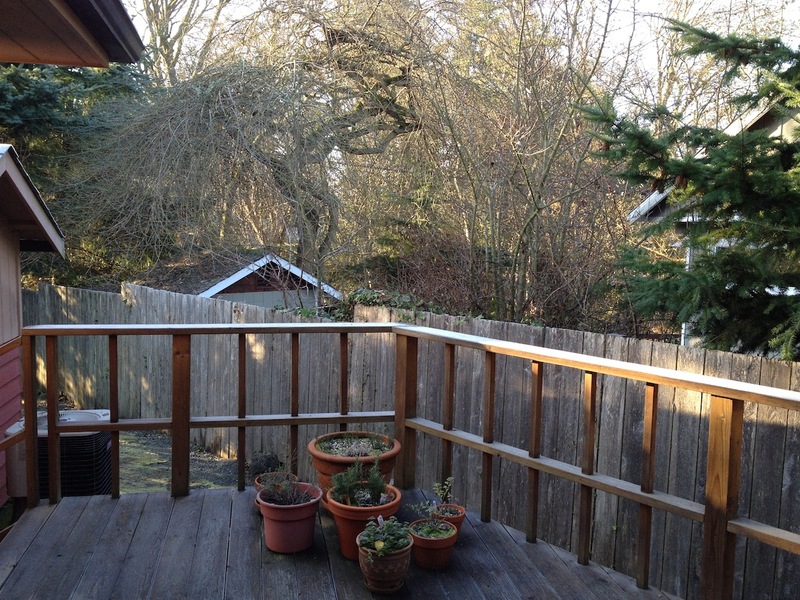 And here’s a photo for you: my back deck and the ravine, taken from the shelter of my kitchen (it was cold!) yesterday morning. But if you want to see some gorgeous pix of Washington, follow Jennifer Durham’s blog, Light Coming Back. She’s a professional in love with nature and she lives right here. I've never thought of describing myself as “in love with nature,” but I suppose it's true. :) Thanks for the shout-out, Nicola. Hild a “a hybrid of Aud and Ammonite?” Interesting…. I'm actually very jealous that you have the pleasure of reading Ali's latest collection still to come.